Back at the shop... . 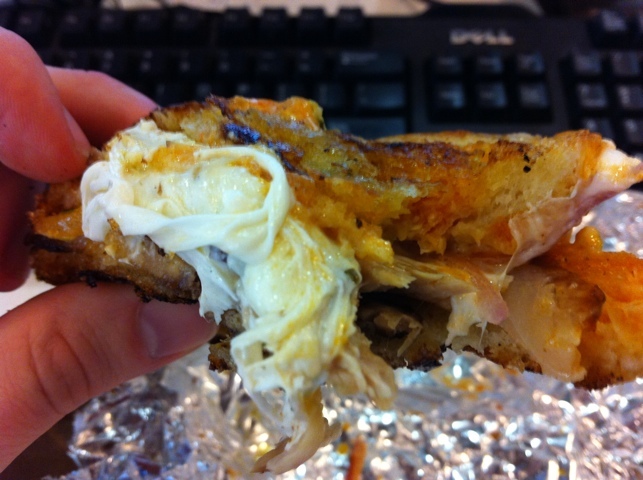 It had been a few weeks since I first tasted the awesomeness that was Da Bomb from Murray’s Cheese Shop on Bleecker Street, and I was definitely craving another – or at least sampling another one of the “melts” they serve there. 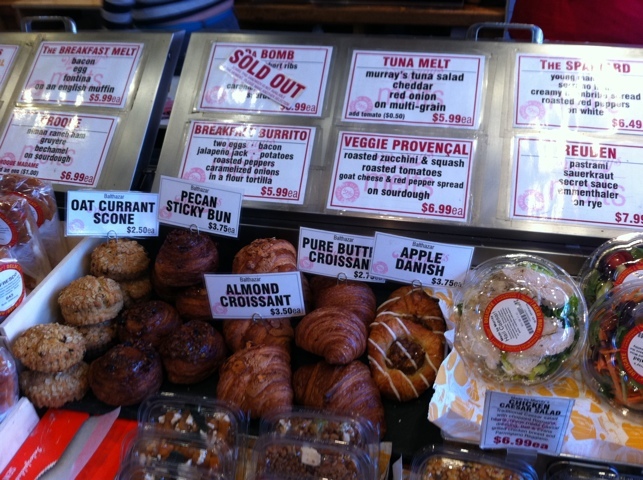 The choice was made for me when I arrived and the Bomb had gone off – they were sold out! That was sore disappointing, but not surprising, considering the degree of awesome involved. Asking for a recommendation, it was suggested I get a special melt, the Nor’Easter: braised pork belly, smoked mozzerella, pesto, mayonnaise, piri piri and red onion on sourdough bread. Again, just $6.99 for those amazing sounding ingredients. The Nor'Easter. 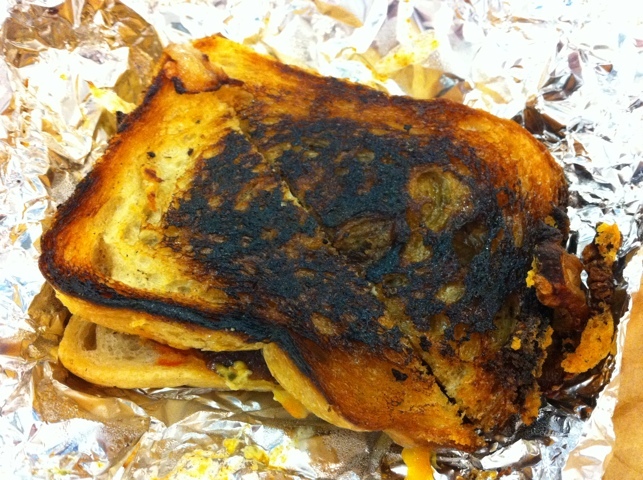 It may look burned, but it wasn't... . I did not know what piri piri was, but it wasn’t hard to guess: a kind of chili. The result is a spicy sandwich with strips of pork belly. I wish I could say it was as good as Da Bomb, but alas, it wasn’t. But it was very good, and I’m amazed you can get the quality of food you can get for the price at Murray’s. So let’s talk about the sandwich. First of all, it wasn’t quite as easy to handle as Da Bomb, which was essentially this overstuffed envelope of beefy, cheesy happy. Notice the construction. The cheese doesn't join the slices of bread. Perhaps this had to do with the Nor’Easter’s architectural construction. Since the pork belly was cut in strips, as you can see above, it was unfortunately all too easy to try biting into one and wind up pulling the whole darn strip sloppily out, leaving a trail of gooey cheese from my mouth to the sandwich. That construction issue made handling the sandwich a bit more work. Perhaps it had to do with the cheese. 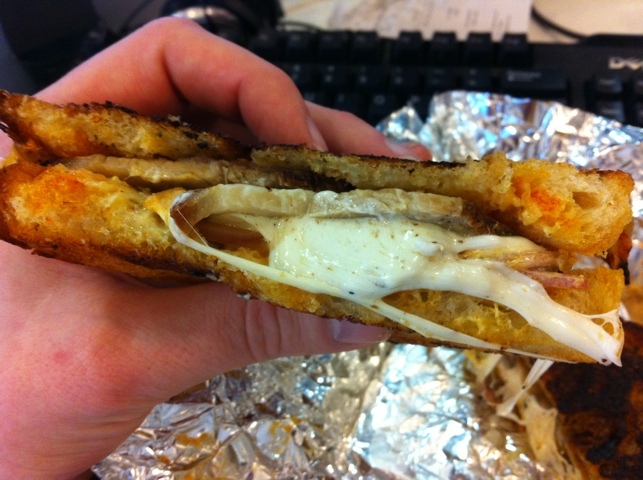 The smoked mozzerella was wonderful, but it did not act as glue sealing the two pieces of bread together, surprisingly. The result was wayward bits of pork belly or red onion might bravely try to escape the confines of the crispy, slightly burned toast. Even if they succeeded, their freedom was short lived, I assure you. The sandwich is tasty enough to go hunting for stragglers. The sourdough toast had a wonderful quality: it was both crispy in places while also sopping with the various juices from the cheese and pork belly. There was a butter note besides… . The spiciness overwhelms the mild smokiness of the mozzerella. The mozzerella itself was of course delightful, but it is too mild a cheese to compete with the spiciness of the piri piri and depth of flavor from the pork. 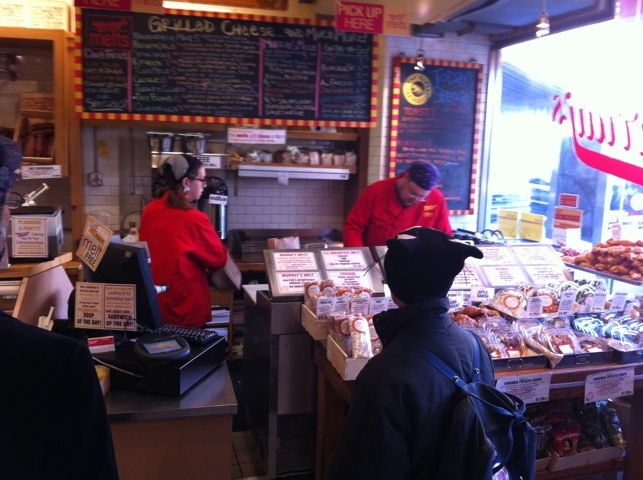 Ultimately, even the pork couldn’t compete with the piri piri, which was the truly dominant flavor of the sandwich. I could not detect any pesto flavor in there – nor even really much onion. The piri piri, by the way, was not blistering hot, but certainly hot enough to get your attention. If you’re not a fan of spices, you should avoid it. On balance, the Nor’Easter was good, but it’s no Bomb. I’m certainly likely to return to Murray’s again.